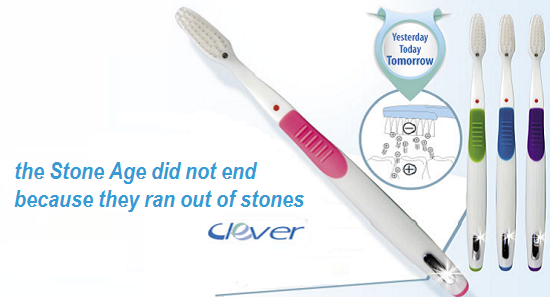 With the evolution of toothbrushes cleaning teeth and taking care of gums is simpler, but this wasn’t always the case. 3500 AC – Egyptians and Babylonians use chewing sticks made from branches of the Salvadora Persica tree. They also used boar bristles attached to a bamboo stick to clean teeth. 1600 AC – In China people start using chew sticks made of plant limbs and roots. 1498 –Europeans start traveling to China to obtain toothbrushes made of bamboo and hog bristles. 1938 – Nylon bristles replace bristles made of pig innards. CLEVER acting on the principle of polarity removes plaque precisely deep beneath the gingival collar, just massaging the teeth.